When I started this blog five or six years ago, I never thought the title would be as a propos as it is today. We are all aware that the dominant economic thought, such as it is, advocates continued and greater spending on the part of all and sundry but, in particular, on the part of government. We have long refuted this argument arithmetically. After all, if giving money to a bank or a company will help the overall economy, think how much more the economy might gain if every man, woman and child were to be placed on a government salary. Yayyy! Everyrone would have unlimited purchasing power. However, considering that every unorthodox, untested and unprecedented plan that has been executed in the past five years has failed to send asset prices soaring again, we can only assume that once Obama does give this lump sum out and the desired results fail to appear, he will be persuaded to just put everyone and sundry on a government payroll already. Do give it a listen. He does actually say that beneficiaries of the free money could go buy a “thingymajic”. Despite the reams of empirical evidence that prove that we have reached the end of the road, the President of the United States of America wants to convince you that everything is all right and that there is no emergency to panic about and, crucially, no need to change course… everything is in hand and will be sorted… Scout’s honor… don’t pay attention to the arithmetic I am POTUS and I tell you we’ll sort it out. ‘allo, ‘allo, ‘allo… wha’ssis then? Candor from a Western leader? I may be wrong and, if so, I can be taken to task some years down the road. My rantings are etched in the ether for all to refer back to. As much as I’d like to think Gordon Brown is being candid, I am not convinced. Crocodile tears is more like it. Old trick: show contrition, say you’ve learned valuable lessons and ask for forgiveness. Result, mollify the masses and hope to get re-elected. Cynicism? Maybe but the historical record says it isn’t. It is just reality. And, by the way. For Pete’s sake! Now Obama is running around telling the world that the oldest James Bond plot in the book is a reality and he wants to create an agency that will be in charge of administering all nuclear material worldwide (ergo a global agency)? Follow the money folks. We are bankrupt. We’ve been bankrupt for a long time. The difference this time around is that sovereigns in the West have lost the ability to induce inflation into the monetary system thus the effects of bankruptcy are now becoming felt. Your one and only indicator to the health of our economies should be tax revenue. For as long as tax revenue is declining, the traditional tools that have allowed us to postpone insolvency for the past fifteen years have lost traction. This is not to say that our “leaders” wouldn’t run a false flag just to inculcate the reality of the threat into the mind of citizens. I certainly wouldn’t put it past them to do something like that. Comparing heads of state and/or public figures to animals is the main stay of satire and a tradition that is as old as consciousness itself. 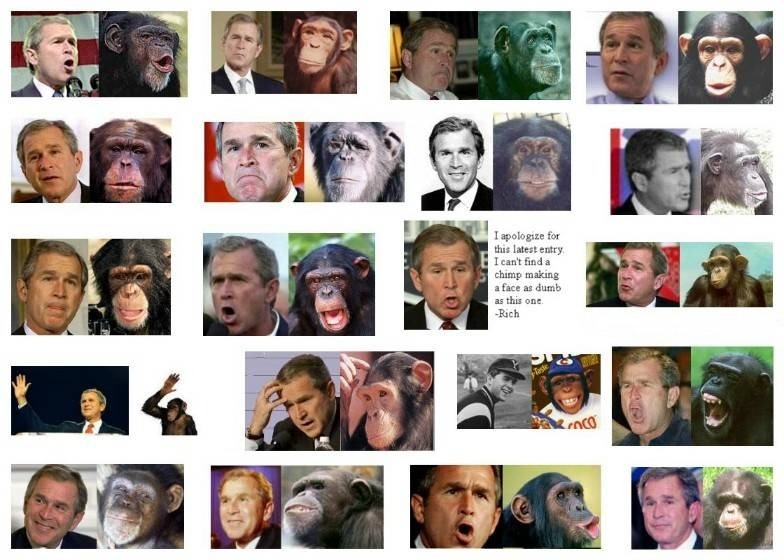 How many times was the latest iteration of Bush depicted as a chimp? 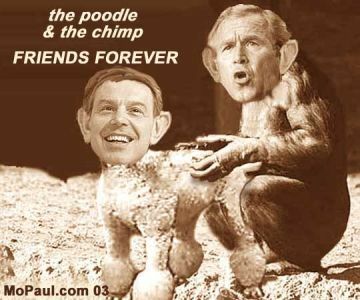 How many times was blair depicted as a chimp? Looks to me like the uppity, fractious, irritable and petulant character of tin pot corrupt and presumably emerging African or Middle Eastern leaders is rubbing off on us more than our “enlightened” leaders are on them. The search for a way to pick up a turd from the clean end intensifies. One of the darkest moments of the Viet Nam conflict, the My Lai massacre was a watershed moment in the conduct of the war. The events at My Lai subsequently spawned a famous quote attributed to a US Air Force Major whom allegedly said that “it became necessary to destroy the village in order to save it”. Still today “My Lai logic” or “Ben Tre logic” denotes the absurdity of gratuitous violence in order to bring about an ostensibly desirable peaceful outcome. “The president laid out the circumstances where war is justified – in self-defense, to come to the aid of an invaded nation and on humanitarian grounds, such as when civilians are slaughtered by their own government or a civil war threatens to engulf an entire region. Just done watching that. It was brutally clear big O is very uncomfortable answering any economic question. He was obviously grasping at straws to put together sentences that convey conviction and certainty that he understands the issue. Regrettably, the only thing Obama seemed to be certain about is that the crisis has been brought about by lack of consumption. When asked what metrics the public should use to see whether government policies are working, he was adamant that a pick up in job creation would be the most important sign. He reiterated that he’d be creating 4 million jobs and after some incoherent pfaffing he ended the sentence saying improvement will be visible by next year. As you can imagine, I’ll have to insert a smart alec observation here. At a time when everything that is happening around us is described variously as “unprecedented”, “worse since the depression” and “once in a lifetime” and when, I might add, we are tossing around Trillions on a daily basis, how can anyone think that we’ll observe improvement by the beginning of next year? Obama is obviously much more comfortable talking about the internal working of government and how to go about things. He was also more comfortable discussing foreign policy and stopped short of saying that Pakistan arent pulling their finger out. But that was the jist of what he said. In other developments. I would be surprised if the wild fires in the south of Australia and the floods in the north of the country along with record freezing temperatures in the West and various emergencies that have cropped up in different countries shouldn’t play havock with the insurance industry. This at at a time when insurance companies are already smack bang in the midst of having to sort out their roles in the credit crisis. If large insurers and re-insurers should falter, one of the bigger problems we should expect is dislocation in the agricultural sector of the industry. So, this bears watching.